Economy and earnings can’t be ignored. Investor sentiment has improved markedly towards assuming risk in stocks. It may be instructive to keep in mind the words of noted British investor Sir John Templeton, as we approach a new investing period for stocks following the US elections. The financial markets, and for the most part the entire world, had misjudged the election outcome and regarded a Trump Presidency as being highly improbable. Most investors, both individuals and institutions, got it wrong. Instead of the prediction of a stock market apocalypse to follow a Trump presidency, investors reassessed the day after and determined that the overall outcome may not be so bad, generally speaking. The stock market will continue to adjust to new policy positions that are disclosed in the months ahead, which will lead to sharp price action. But for now, with the election fervor behind us, the US stock market can begin to get back to fundamentals. And fundamentals are supportive of higher stock valuations. The three key pillars of the stock market are the Earnings, Economy, and the Federal Reserve Policy. Much of what affects market valuations over the long-term can be distilled down to these three. Earnings discussions often end up being a matter of perspective. For every Microsoft (MSFT), Netflix (NFLX), Google (GOOG) and Merck (MRK), which have reported strong earnings for the calendar third quarter, people would quickly point to Facebook (FB), Amazon (AMZN), or Pfizer (PFE), which disappointed. It is important to look at collective earnings to get more meaningful insights. Using the S&P 500 earnings as a guide, it is clear that earnings have outperformed market expectations for the third quarter, and are providing a supportive valuation floor from which the stock market can move higher, following the ebbing of election cross-currents. As of the end of last week, 85% or 425 S&P 500 companies had reported earnings of which over 70% of the companies delivered earnings above the consensus or mean estimate. Prior to the earnings season, the expectation from S&P 500 companies was for an earnings decline of -2%. 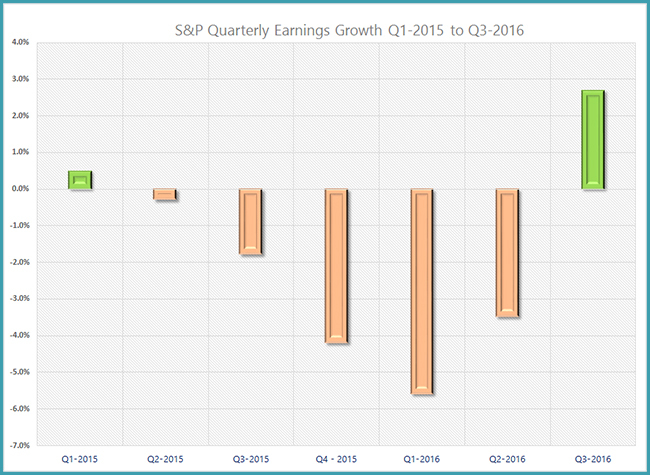 Thus far, the S&P 500 companies have reported an earnings growth rate of +2.7%, as per Factset. If this trend continues, as it most likely should with only 15% of the companies left to report, the third quarter will finally mark the end of five consecutive quarters of earnings decline for S&P 500. In earlier Seeking Alpha articles, The State Of The Stock Market Days Before Elections, as well as It's October, And The Market Has Not Given Up Yet, we had discussed the strong contribution that the Technology sector would continue to make to S&P earnings. The third quarter earnings that have been reported thus far hasshown Technology providing a strong assist with 87% of thecompanies reporting better than expected earnings. No other sectorin the S&P 500 has a better record for the third quarter. An interesting factoid to note is that the next quarter estimate hasbeen reduced by 1.2% for the S&P 500 companies. However, if itmay sound bad, this is not a meaningful reduction and is in fact thelowest decline in recent years. The average decline in next quarterearnings for the past four quarters was -2.6%, as per Factset. Takenover a longer horizon of 5 years or 20 quarters, the average declinehas been -2.4%. The turnaround in S&P 500 earnings bodes well for valuations. Basedon S&P 500 estimated earnings of $131.43 for forward 12-months, as per Factset, the index is trading at a P/E ratio of ~16. The bottom-line here is that earnings have proven to be supportive and will provide a platform for valuations to shift higher, as election-related concerns now begin to recede. The key economic indicators are indicating a measured pace ofgrowth. GDP growth, payroll growth, consumer spending growth, consumer confidence, and now even wage growth, are all pointinghigher. The state of the economy is supportive of valuations. GDP is pulling-up from its low pace in the first-half. The Non-farm Payrolls have been steady at above 150,000 new jobs over the recent months. Consumer or Personal Spending climbed strongly during Septemberby 0.5%, after a dip in the prior month. This certainly bodes well for a measure that accounts for a significant part of the economy. The recent payroll report also revealed growth in average hourly earnings, which rose 0.4% from previous month to $25.92, and rose2.8% year-over-year, the largest increase since June 2009. With the election uncertainty over, businesses can now determine the investment pace that delivers productivity gains. Business investment spending has been weak in this recovery, andhas been declining for the first-half, as represented by Private Nonresidential Fixed Investment. This measure has now leveled-off and it is expected that a tighter job market, improving GDP growth, and expectations of higher interest rates in future, will spur business investment, particularly as the fog of election uncertainty has finallycleared. Business investment spending is critical to extending theeconomic growth cycle. The bull market will be punctuated by corrections as we have experienced a couple of times this year. But slow and improving growth doesn't mean a recession. And if there is no whiff of arecession, then there should be no economic reason for a bear market. The bottom-line here is the economy at this point doesn't see arecession. Growth is low, but improving, and consequently the state of the economy is supportive and even favorable towards higher valuations. The Federal Reserve Bank has been very restrained in raising rates and has not followed a set pattern. The central bank has used the absence of any economic sirens, likeinflation, perched on the gray walls of the Federal Reserve, to push towards its part-mandate of full employment. This may perhaps change if the new administration pursues a fiscal stimulus and spends heavily to boost economic growth, thus pushing the Treasury debt higher and setting conditions for inflation. Although, a December rate hike is very likely based on the economic situation and the absence of any crisis issues, the shallow and lengthy path of rate increases continue a generally accommodative policy of the Federal Reserve. Major central banks are all maintaining a relatively loose policy. 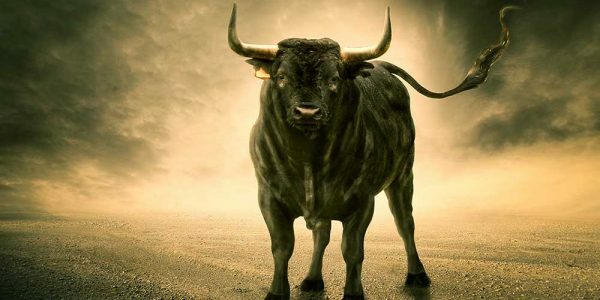 A patient Federal Reserve is important to the health of a bull market, as an imprudently aggressive change in monetary policy can choke off a recovery and push the economy towards a recession. The thought of a December 2016 increase brings back memories of high volatility and sharp decline over the months following a December 2015 increase. At that time we had noted a steep shrinkage in risk appetite in a January 2016 Seeking Alpha article"Fed's Done for Now:"
With additional volatility comes a shrinkage of risk appetite, which disproportionately affects relatively higher-risksegments of the market like small caps, and sectors like technology and biotech. So a prudent strategy, particularlyfor individual investors, remains a consideration of maintaining a predominantly cash position, as we have donesince July 2015." That was December 2015. This time we believe there will be a periodof natural volatility in anticipation of a rate increase during December. But we don't see the need to be entirely on the sidelinesin the final month of the year. The bottom-line is that the monetary policy remains benign. Assuming a quarter-point increase does occur next month, the next increase may be a conversation that will be more relevant during the second quarter of 2017. The continuing shallow path of further increases remains dependent on the policies of incoming administration, but nonetheless is supportive of current valuations. The elections cycle is over, and it's time for investors to align the portfolios to the new expectations. The three key reasons that drive stock valuations are poised favorably for investors. We believe a combination of strong fundamental support and improving investor sentiment is a good combination to move valuations higher for the rest of the year, recording new all-time highs. We recommend investors should consider staying the course with stocks for the rest of the year. It may be tactically prudent t oconsider raising some cash during early December to allow Federal Reserve related volatility to subside. The overall stock market trend should remain higher heading into 2017, but will then be contingent on the policies of the incoming administration and its ability to unite the nation. After a flight-to-safety over the past two weeks, investment capital is now once again seeking risk. We had entered November with an approximately two-thirds invested position in our Graycell Smallcap Portfolio which is up+58% for the year, as well as in our Prudent Biotech Portfolio which was down -7% compared to benchmark Biotech Index ETF (IBB) decline of -24%. There are now many promising ideas across multiple sectors that are poised to perform well, with some sectors benefiting more than others from a new administration. Pharmaceuticals and Biotechnology are industries that are very well-positioned now as thepressure of potential regulation has been relieved. Besides companies like Microsoft, Akamai (AKAM), Google, we also continue to like healthcare and biotech companies like Pfizer , Alkermes (ALKS), Seattle Genetics (SGEN), Tesaro Pharmaceuticals (TSRO), Biogen (BIIB), Incyte Corp (INCY), GW Pharmaceuticals (GWPH), Exelis (EXEL), Clovis Oncology (CLVS), Colucid Pharmaceuticals (CLCD), Agios Pharmaceuticals (AGIO), Sage Therapeutics, Corcept Therapeutics (CORT), and Biotech Index ETFs (IBB and XBI), amongst others. This is an opinion piece focused on investment outcomes. If you feel same or differently about the market outlook, please share your viewpoint below in the Comment section.